The Intelligencer (Lancaster PA) uses the spelling Ogdon for Aaron Ogden. "Extract of a letter from a Gentleman at Trenton, dated November 25, 1802. 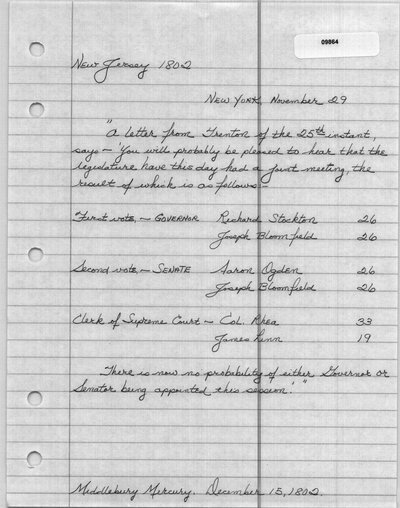 'This afternoon the two Houses of the Legislature have had a joint meeting, for the purpose of choosing a Governor... On the first question Bloomfield had 26 votes, and Stockton 26 votes; on the question being put, a 2nd time, Bloomfield had 26 votes and A. Ogdon 26 votes; so that no Governor is elected; nor is there any probability that one will be elected this year.'" The Intelligencer, and Weekly Advertiser (Lancaster, PA). December 7, 1802. "A letter from Trenton of the 25th instant, says - 'You will probably be pleased to hear that the legislature have this day had a joint meeting, the result of which is as follows - First vote - Governor, Richard Stockton 26, Joseph Bloomfield 26, Second vote - Senate Aaron Ogden 26, Joseph Bloomfield 26, Clerk .... There is now no probability of either Governor or Senator being appointed this session.' " Middlebury Mercury (Middlebury, VT). December 15, 1802. The Intelligencer, and Weekly Advertiser (Lancaster, PA). December 7, 1802. Middlebury Mercury (Middlebury, VT). December 15, 1802.